Cultural relevance is crucial in messages. Some messages that might play well with a primarily English-dominant audience might not resonate with a more bilingual or even Spanish-dominant audience. When communicating about topics like voting and elections, access to healthcare or emergency response, it’s important to speak the language that your audience speaks—whether that’s English, Spanish or something in between. There’s a need for us to work together more on this! We plan to continue the conversation, both online using the hashtag #SomosSocial, and through more trainings, webinars and future discussions. If you have an idea or want to reach out, email us. 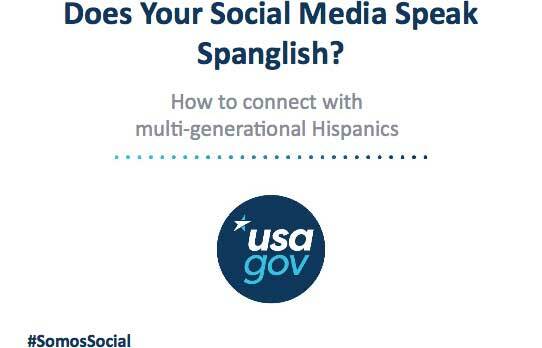 And don’t forget, you can view all the presentations from the event or check out the video-recording on the DigitalGov YouTube channel.This article was originally posted on the USAGov blog by Leilani Martinez, Jessica Milcetich, Edgardo Morales and Victoria Wales, who are part of the USAGov Marketing and Outreach Team.